"Coach Bohn holds nearly every kicking record imaginable here at Utah State. Coach Bohn was able to do what very few kickers can..."PERFORM" when they are asked to consistently - without over analyzing a situation. You will find no better coach that understands the mental and fundamental aspects of kicking at the Division I level than Brad Bohn...Learn from him." "Brad Bohn kicked for me at Utah State University and was very technically sound as a kicker. He has carried those traits with him and possesses the same skills as a coach." "Here's some urgent advice to football coaches: Start working on your kicking games. The losses are mounting and the embarrassment is spreading by the failure to make an extra point or field goal. And the blame isn't on kickers alone. Long snappers aren't snapping the ball properly. It's particularly gruesome in the City Section, but even Concord De La Salle is having trouble with extra points. And Los Angeles Loyola probably lost its game Saturday to De La Salle because of a short field-goal attempt that was returned 75 yards. There are private coaches who train long snappers and kickers. Go to westcoastkicking.com for emergency help." My son has been training with Brad Bohn at West Coast Kicking Academy for over 3 years and has benefited greatly from working with Brad and his staff. The instruction he has received has helped him continue to improve over this time, which has allowed him to compete at a high level. This training has now taken him to a level that is generating a great deal of interest from colleges across the country. Brad and his staff teach techniques that enable kicker's to maximize their abilities. They use video very effectively, to breakdown the kick from beginning to end, not only showing the students what their doing well, but where they can improve. Because WCKA trains it kickers in small groups, the boys get a lot of personal instruction, which is very beneficial. Brad not only teaches kicking, but also takes a sincere interest in the boys and gives them guidance about other things colleges are looking for in their athletes, like good grades and being good human beings, to name a few. Our family has had a long and fruitful teacher/student relationship with Brad. We have been with WCKA for over four years. We have seen the iterations of the business unfold, but more importantly we have seen Brad's wisdom and kindness become manifest with our sons. The kicking aspect of football is a delicate duet of technique and emotional focus; Brad sees these as intertwined and has taught my sons accordingly. As parents, we want the best for our kids. We achieved that in our time with Brad. He has used the most advanced filming setup of any camp or instructor in the country. He has formed an excellent relationship with both of my sons. He treats each different. He has congratulated them on their success and consoled them when they were not as successful. He has helped them set very high goals and then helped them to achieve those goals in a methodical and clear way. Along the way Brad has helped each one of our sons look at reality and plan for that reality. While Brad is inherently and optimist, he keeps his students in the here and now. He communicates. We hope our time with him and WCKA continues for many years. Brad Bohn has been teaching, instructing and guiding my son for the last 5 years. The weekly personalized instruction including the use of the video system at each practice is testament to Brad's professionalism and commitment to each of his students. He has helped prepare my son both physically and mentally to kick at the D-1 level. I would highly recommend The West Coast Kicking Academy to anyone desiring to improve their kicking game. Coach Bohn brings the whole package when you are looking for a kicking coach. His personal kicking experience, teaching techniques, background in psychology and a proven track record of training some of the top kickers in the country year after year. Our son opportunity to train with him on a consistent basis is a cornerstone to his achievements. Simply put he would not be where he is without Coach Bohn. Brad Bohn evaluated my son Louis as a freshman. He was taught the basic fundamentals of kicking and brought along rapidly to become the starting varsity kicker as a sophomore. The continuous training, support, and development made Louis become a nationally recognized college level kicker. I would highly recommend Brad Bohn and West Coast Kicking Academy to any athlete that has the desire "to be the best that they can be." Three years ago, when Chase was at an athletic crossroad, we came out for a kicking evaluation with great hesitation. To our pleasure with found that it was the best things that he could have ever pursued. The "Family Like" environment, "State of the Art" Video equipment and "One on One" training have taken Chase from an entry-level kicker to an "All League" player. True, there are other places to get kicking instruction, but the level of professionalism, enthusiasm, and results a young man receives from Brad and Alan Bohn (West Coast Kicking) is unparalleled. After working with you and your dad for the past few years, Zach has become an extremely good kicker and punter. It's apparent that the personal small group sessions have given Zach the ability to stand out at local and national competitions. In fact, I find that WCKA kickers are amongst his competition at these events, which is a further testament to your teaching skills. Watching Zach hit a field goal or drop a kickoff deep into the end zone, is just as exciting as any touchdown pass. Brad, many thanks to you and Alan for preparing Zach mentally and physically for his senior season. My son started kicking in October of 2007 as a junior in high school. He began training with Brad Bohn in December of 2007, as a senior he became an all league and all valley kicker. "Our son has reached a new level in kicking thanks to Coach Bohn. Coach Bohn is an enormously gifted teacher who trains his students in the most current and proven techniques as well as stressing the importance of training for both physical and mental fitness. His practices are extremely organized, professional, and enjoyable for his students. Thank you Coach Bohn for your commitment and dedication!" Brad Bohn has helped to improve my son's technique as a kicker. He is an excellent trainer; I would recommend his academy to anyone who wants to take their talent to the next level. I wanted to let you know how much your kicking program has helped me. I have been given the opportunity to compete against some of the best kickers in the nation. This has allowed me to rise to the event and be my best. This camp has allowed be to improve my skills. I am looking forward to next year's season and I won't forget the help you have given me. With coach Bohn's training program I made 1st team All-League and am representing my school in the Orange County All-Star game. Coach Bohn helped me fix my weak areas and develop a higher skill level in order to perform better and become more consistent. "Coach Bohn's training program taught me the skills and techniques to be a kicker. 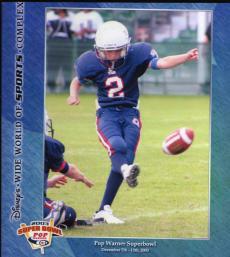 At 12, I am kicking 35 and 40 yard field goals. My 95% PAT performance and 2 game winning field goals helped my Santa Margarita Pee Wee Titan Team go to the Pop Warner Super Bowl in Florida last December. Coach Bohn makes practices fun!" "Coach Bohn is a fantastic kicking fundamentals teacher. He will help each player he works with. A high quality, person, coach and teacher. I highly recommend Coach Bohn." "Coach Bohn is a great technique oriented coach and a great motivator. If you're looking for that extra edge to make you the best kicker that you can be, then this is it. Remember... to win games, all you need is a defense and a KICKER!" "If you would like to take your kicking skills to the next level, become more consistent with your kicking perfomance, then coach Bohn will definitely help you." "Brad greatly improved our kicker's distance and accuracy. Our punter's hang time and distance increased over 20%. Excellent technical teacher and motivator. As the players say 'Bohn is the bomb'!!"